Be the first to share your favorite memory, photo or story of Jeffrey. This memorial page is dedicated for family, friends and future generations to celebrate the life of their loved one. 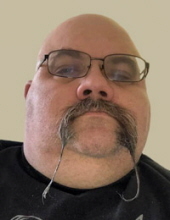 ALEXANDRIA, IN-Jeffrey D. “Bodeen” Whitmill, 50, passed away on Wednesday, March 20, 2019 at St. Vincent Hospital in Indianapolis following an extended illness. He was born on June 4, 1968 in Anderson to Dale and Nancy (Greene) Whitmill. He was a graduate of Madison-Grant High School-Class of 1987. Jeff was a welder by trade and had worked for several companies down through the years. He belonged to the Grandview Church of the Brethren in Pendleton. He loved his work there with the youth program and volunteering. He enjoyed fishing. He was preceded in death by his father in 1998; and his step-father, William “Bill” Cook in 2004. At Bodeen’s request, cremation will take place. No planned services, a Celebration of Life will take place at a later date. Owens Funeral Home in Alexandria is honored to care for Bodeen and serve the Whitmill family. To send flowers or a remembrance gift to the family of Jeffrey D. "Bodeen" Whitmill, please visit our Tribute Store. "Email Address" would like to share the life celebration of Jeffrey D. "Bodeen" Whitmill. Click on the "link" to go to share a favorite memory or leave a condolence message for the family.